We are currently experiencing difficulties with our TELSTRA ISDN Phone lines. PLEASE EMAIL US WITH YOUR QUERY OR SEND US YOUR NAME, NUMBER AND WE'LL CALL YOU BACK. Check out our Clearance Category for stock that we have excess quantities of, be short dated/expired or have some minor damage on the packaging. In this area only items will be as discribed and non refundable. Like us on Facebook for updates as some items sell out quite fast especially health products. We will be continuing to despatch over the holiday period as much as possible however there are a few dates to consider that we are closed which will impact our standard despatch and delivery times. So please remember to allow a little extra time than normal for your order to arrive due to all public holidays and weekends. We will continue to take your orders over the Christmas and New Year period via our website. However, if you order on a public holiday it will be processed on the next available business day. As normal no orders are despatched on weekends. Please feel free to email any enquiries you may have to info@onlinepetcart.com.au or use our "Contact Us" Form here and we will attend to your needs as soon as possible. We would like to wish everyone, including our furry, finned and feathered friends a Very Merry Christmas and a Very Happy & Safe New Year. Online Pet Cart would like to thank all of our customers for their support during 2014 and look forward to supplying all your pet needs in 2015. Christmas is fast approaching and you don’t want to run out of your pets needs over the Christmas and New Year Period. Online Pet Cart would like to thank all of our customers for their support during 2013 and look forward to supplying all your pet needs in 2014. For your convenience and/or for those who like to keep up to date on the newest products on our site we now have a “New Arrivals” tab. All items will remain here for a 60 day period after which they will then remain listed in their relevant category only. Please feel free to let us know if you are seeking a specific pet product that is not listed on our site by dropping us an email via our Contact Us Form or by calling us on 07 3801 1266. We will then try our best to supply and list the item as quickly as possible. Check out our category for our stock that we have excess quantities of, short dated/expired or have some minor damage on the packaging. Once again we have made it through another flood in Queensland. With only a minor impact on some of our orders and their despatch times due to road closures and our stock not coming in as scheduled. Back orders will be cleared in the next 24-48hours. Australia Post's mail services have resumed and most post offices are operating as normal though the Bundaberg North Post Office remains closed due to flood damage. We would like to thank all of our customers for their patience if your order was delayed outside of our standard processing times. Widespread flooding in Queensland and New South Wales has significantly disrupted Australia Post's mail services and our incoming courier services and as a result may cause some minor delays in order processing and delivery times to certain areas. A number of Post Offices are closed, and mail delivery and street posting box clearances have been impacted. We will continue to provide further updates when available. Donations can be made at Australia Post retail outlets for the Red Cross Queensland Flood Appeal from Thursday 31 January. Any orders received after this date may not reach you until after the 27th of December or the 2nd of January depending on your location. Please allow more time than normal for your delivery during this very busy time and remember to consider all public holidays also. We will continue to take your orders over the Christmas and New Year period via our website. And as normal no orders are despatched on the weekends. 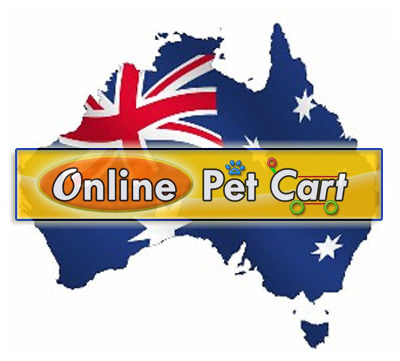 Please feel free to email any enquiries you may have to sales@onlinepetcart.com.au or use our "Contact Us" Form here and we will attend to your needs as soon as possible. Online Pet Cart would like to thank all of our customers for their support during 2012 and look forward to supplying all your pet needs in 2013. It's Brisbane's 2012 Ekka Show Time Again!!! As always our online shop is open 24/7 though there may be some minor delivery delays due to the Ekka Show Holidays in Brisbane. With the public holidays being on 2 different days for two areas being on Monday (Logan) or Wednesday (Brisbane's People's Day) which will effect different postage services on different days. Monday is our official day and our Australia Post Business Centre will only be closed on this Monday (13th August) so all orders will go out on the next business day being Tuesday (14th August). As always we will work around this the best we can to try and avoid any extended delays.